If you’ve managed to wait until the very last minute to pick up a gift for your pre-teen or teen girl, then you might want to check out PBTeen. They usually have several cute products that sync up with your gadgets. This time they have the Painted Dot iChair. I’m sure you can guess what it’s meant to hook up to by the name of the chair itself. 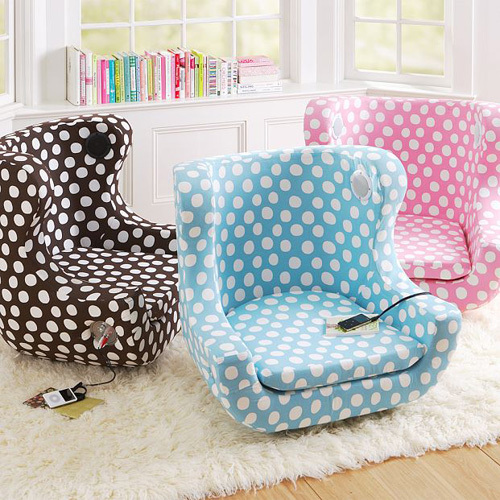 The cute polka dotted seat looks pretty and hooks up to any MP3 player as well as other audio devices. It can also hook up to a game system, if your young teen likes to do a little gaming as well. The speakers are positioned nicely to make sure that whoever is sitting in it gets to hear nice full sound. The chair is weighted to prevent tipping, however, it also rocks a little. It features high-quality speakers as well as a control panel, so that your tunes never get too loud. Currently they don’t have anymore of the pink, but they do still have the brown and the blue. You can pick it up for $349.